Enjoy this spooky 5 x 4, 40 win line slot game with Casper the friendly ghost. Turn the mystery mirrors and symbols and match 3 to win 5 free spins. Initially making their names as creators of land based arcade machines, Blueprint Gaming have made joined the evolution to online video slots. Known for their infamous adaptations of classic film, TV and well distinguished games. With titles such as The Naked Gun, Top Cat and Bejewelled 2 Slots as well as a rage of completely unique content (such as Heroes of Spin and Paws of Fury) Blueprint gaming strive to keep pushing creative boundaries in both their themes and game play, changing the landscape of what an online video slot can be. Blueprint Gaming have brought a childhood classic to life. 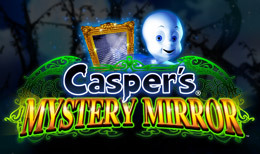 Get ready to be reintroduced to your favourite friendly ghost in Casper’s Mystery Mirror. This graphically enticing video slot contains 5 reels and an enormous 40 possible pay lines. With several bonuses to be discovered you will never see a dull moment with this phantom family. Because of its famous theme, players should expect to see characters such as Casper and the Ghostly Trio - Stinkie, Fatso and Stretch throughout the reels. As well as the ghouls, the reels also contain the classic playing card symbols 9, 10, J, Q and K. Catering to all player types, Casper’s Mystery Mirror is playable from as little as £0.40 per spin or to as much as £200 per spin – the amount wagered directly effects the available win amount, as always, the higher the risk the higher the reward. Throughout the game, players can wreak massive rewards during the Casper Free Spin Bonus round, this is triggered by matching 3 of the Bonus Symbols on the 3 central reels (2, 3 and 4). This will gift the player 5 Free Spins to play and win huge cash pay outs at 0 cost to the player. During the free spins a Mystery Mirror symbol will begin to appear – a singly symbol will then be chosen at random to be shown in all Mystery Mirror Symbols. These symbols then become Sticky meaning when the reel spins for a Free Spin they will remain in place. This will dramatically increase the players chance of winning as many of the symbols within the reel are already a match. Free Spins can be retriggered at any point by simply matching an additional set of 3 Casper Symbols – the game will allow these Free Spins to stack for up to 255 Free Spins, meaning players can keep winning time and time again whilst accumulating a healthy pay out. Blueprint gaming have taken a childhood classic and made it completely casino ready. Staying true to the aesthetic and vibe that has become synonymous with the Casper franchise, their ability to translate it into a completely new and out of the box medium is the perfect example as to why this developer is climbing the ranks in the online casino world. The chance to gain Free Spins featuring Sticky Bonus symbols increases the possible ways to win dramatically, resulting in the incredibly generous final 95.23% pay out percentage.